Harrier , a variety of the hound (canis sa-gax, Linn. ), used in hare hunting. 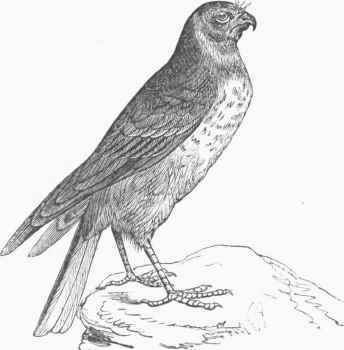 The ancient harrier (chien courant of the French) had a moderately long, broad muzzle; thick and rounded head; large, long, and pendent ears; robust body, stout limbs, erect tail, and short hair, varied with black, brown, and yellowish spots. The modern improved harrier is a miniature fox hound, with shorter ears, an acute sense of smell, great speed, and a height of about 18 in. The old harrier was larger, slower, and more inclined to dwell on the scent; the modern breed does not generally allow the hare to double on its tracks, but forces it into a straight course, running it down in about 20 minutes. 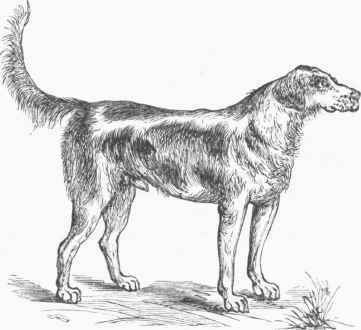 The pack of Sir John Dashwood King, considered the model of this dog, originated from a small fox hound of pure breed, which was so celebrated that he was sold for the enormous sum of £700. The old harrier came near the beagle in appearance and manner of hunting. There are several breeds, of more interest to the sportsman than to the zoologist. Harrier , a hawk of the subfamily cercinoe of Gray and milvinoe of later ornithologists, and of the genus circus (Lacepede). The genus is characterized by a rather large head and a face partially encircled by a ring of short prominent feathers as in the owls; bill short, compressed, curved from the base, with the lateral margins festooned; nostrils large; wings long and pointed, with the third and fourth quills nearly equal and longest; tail long, wide, and rounded on the sides; tarsi long and slender, toes moderate, and claws rather slender and weak. About 15 species are described in various parts of the world, generally found in open uncultivated countries, in marshes, and along barren sea coasts. The flight is not very swift, but easy and graceful, and generally performed in a sailing manner within a few feet of the ground. The American harrier, marsh or hen hawk (0. Hudsonius, Linn. ), has in the male a length of about 18 and an extent of wings of 44 in., and in the female a length of 21 and a spread of about 47 in. The form is rather long and slender; the general color above is pale bluish cinereous, which prevails also on the breast; the upper tail coverts white; dark fulvous tinges on the back of the head; under parts white, with more or less heart-shaped spots and longitudinal marks of reddish fulvous; quills brownish black, tinged with ashy on the outer webs, and the inner mostly white; tail cinereous, nearly white on the inner webs, and obscurely banded with brown, its under surface and the under wing coverts white. In the young birds the upper parts are dark brown, with dull rufous edges to many of the feathers; under parts reddish white, with brown stripes, and upper tail coverts white. It is found throughout North America from Mexico to the arctic regions, from the Atlantic to the Pacific, and in Cuba. It breeds in most parts of the United States, and is often seen in flocks of 20 or 30. When paired, the sexes keep together, and assist each other in the care of the young. The nest is generally made on the ground, previously scooped out, of dried grasses, and of considerable bulk; sometimes they build in low bushes. The eggs, about four, are rounded, smooth, 1 3/4 by 1 1/4 in., bluish white, with a few marks of pale reddish brown. The bird skims over the open fields, diligently searching for food, which consists of crickets, lizards, frogs, snakes, and small birds and quadrupeds; it is fond of visiting remote poultry yards after young chickens and goslings, though a hen of ordinary courage is usually able to drive it off; it rarely strikes its victims on the wing. The ring-tailed harrier of Europe is the G. cyaneus (Linn. ); there are also Montagu's harrier (C. cineraceus, Mont.) and the moor or marsh harrier (C. oeruginosus, Linn. ), having similar habits with the American species.